Do you weld Pilot frames in the Netherlands? No. We work with an experienced welder in Asia. Do you develop your frames in the Netherlands? Yes! All research, development, and testing is done in the Netherlands. Do you assemble your bikes in the Netherlands? Yes! All Pilot bikes are assembled at order, the wide choice of parts in our bespoke program makes that 90% of the bikes leaving our shop are different. Every bike will be build by one certified and professional mechanic using the best tools available in our state-of-the-art workshop. Do you have a owner’s manual? Yes, your very own Pilot bike will be delivered with a owner’s manual (you can also download it here). Read the manual carefully before you make the bike ready for the first ride. When you have doubt please visit a certified mechanic. Where can I find torque specs for Pilot products? What’s the standard frame finish? Our frames come with a standard hand brushed finish with blasted logo’s. We prefer to not use vinyl or waterslide stickers as they get damaged over time and don’t fit the pure look of our Titanium frames. We also offer black-chromed or paint job finishing. How do I refurbish my Pilot frame? Brushing is a delicate job, it takes time and willpower to get a satisfying result. For brushing our frames we advice to use Scotch-Brite™ CF-SH abrasive sheets. If you do not want your hands get dirty or you need new blasted logo’s we offer a refurbish program, for more information send an email to service@pilotcycles.com to the known of it. Yes. We offer repaint service for Pilot frames only. After we make sure that you’re frame is in mint condition we prepare it for paint. We will take time for personal contact using email, visit or phone call to come to the wright design and color. Yes! We are happy to invite you to visit our company; you can feel, touch and experience our bikes in real life. We offer a wide range of test bikes, which are available on appointment. Before you visit our company make sure you send an email or call us to make an appointment. What’s possible in your tailor made program? A-lot! Our philosophy is that we want you to sell you the bike you really want, not the bike we want to sell you. In our tailor made program you have the possibility to adjust geometry according to body sizing and riding characteristics. Our experienced designers will take time and care to come to the best design to match you’re wishes and needs. See Tailor made in the Menu of our website to discover the possibility’s within our concept. Pilot stock frames are available in four sizes. None of them are a perfect fit for me.. Do I need to go full tailor made? No, we offer custom stock frames. This means we can build one of our stock frames with custom geometry, using the original tube set (length of tubes and angles to vary). See frames in our website menu for more information. How long does it takes to produce a Tailor made frame? After you confirm the design it takes 8 weeks with a maximum of 12 to finish your frame. How long does it take to design a tailor made frame? Designing a custom frame is a delicate job. It takes a lot of knowledge and time, the more information we receive from you the faster the design will be finished. We strongly recommend visiting one of our dealers, a local bike fitter or you’re LBS for a fitting. We can work with most systems and will translate the data to a design. The average time to design a custom frame is 1 to 3 weeks, depending on the information. Changing a design will take time, the more complete the information we receive the faster production will start. I have a medical disadvantage, are you able to fit me a bike that will make me enjoy cycling again? Yes! We have a lot of customers riding a custom Pilot because of a medical reason, your riding position can be crucial for your cycling pleasure. We strongly recommend speaking to a sports doctor or certified bike fitter. Do I need to do a pre-payment for full custom bikes? There is no dealer around my area, does this mean I can not buy a Pilot? No! We are always expanding our network by working with experienced dealers, and looking for new contacts. If there is no dealer in you’re area we will sell direct to you. If you have a local bike shop witch earned you’re trust by being a great help and solid supplier we are happy to get in touch and make sure the bike will be delivered by you’re favorite dealer! Is there any warranty on Pilot frames? Yes, we offer a “Lifetime” warranty on all Pilot frames. See Warranty in our website menu for more information. Is there any warranty on Pilot Parts? Yes, Pilot Ti & Carbon parts carry a warranty period of 24 months. See Warranty in our website menu for more information. Where is my frame number located? All Pilot frames come with a serial number, this number is unique and will be registered with you’re name for warranty. You will find the serial number under your bottom bracket, Pinion frames have number in top of the Pinion bracket. Will I be informed about shipping? Yes, after you’re purchase you will be updated in you’re personal page. Here you will find all information regarding you’re order. 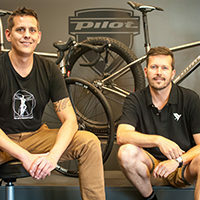 If you need more information send an email to service@pilotcycles.com to receive a fast reply.